1855: Ernst von Bibra; 1860: Mordecai Cooke; 1924: Lewis Lewin. These are some of the dates and of the scholars pioneers in the modern multidisciplinary science of psychopharmacology, or, in other words, in the study of drugs and of the universal human behaviour of "taking drugs". Nevertheless, the origins of the Western science of psychopharmacology, dating back to the nineteenth century, could still be to be discovered, at least partly, considering the "oblivion" to which the Italian Paolo Mantegazza has been consigned so far. One feels the urge to wonder how many other pioneers of such a stature were neglected only because they spoke and wrote in languages different from those of the present scholars of the history of modern psychopharmacology. The date of his main work on drugs, 1200 pages, Quadri della natura umana. Feste ed ebbrezze ("Pictures of human nature. Feasts and inebriations"), printed in Milan in 1871, and the quantity and the quality of his studies in this field induce to consider Mantegazza as the Italian pioneer, as well as one of the European pioneers of modern psychopharmacology. After having examined some chapters of the Quadri, Albert Hofmann commented as follows: « It is really strange that the very important work by Paolo Mantegazza did not receive the deserved attention in the English and German books on the "hallucinogens"» (Hoffmann, 1995). I intend to present here, in preliminary form, this extraordinary personage of the last century, his interests and his studies on psychoactive compounds and on the states of consciousness resulting from their use. Mantegazza is well-known among those interested in cocaine. In all texts dealing with the history of cocaine he is recognized to be the author who in the nineteenth century raised the Western interest in this drug, by means of his never-to-be-forgotten writing Sulle virtù igieniche e medicinali della coca e sugli alimenti nervosi in generale ("On the hygienic and medicinal properties of coca and on nervine nourishment in general") of 1858, which won a prize and caused a great sensation both in Italy and abroad. However his name was relegated almost exclusively to the subject of cocaine, whereas his interests in drugs was much wider, prompted by reasons and aims of a wider range. Mantegazza was interested in all drugs, and in 1859 proposed a classification of significant historical consequence for it precedes by more than 60 years that propounded by Lewis Lewin in his Phantastika of 1924. Eccentric and hyperproductive personage, Mantegazza was interested in the most different topics of different scientific disciplines, and wrote a great number of books and articles concerning physical anthropology, ethnology, medicine, hygiene, sexuality, but also the legends of flowers, "the art of being happy", and the "glory and joy of labour". Among the physiological studies, I mention his books Fisiologia del piacere ("Physiology of pleasure") (1877), Fisiologia del dolore ("Physiology of pain") (1880) and Le estasi umane -Human ecstasies (1887), masterpieces of the new-born sciences of neurophysiology and physiology of "nervous" states, i.e. of the states of consciousness and ecstatic states. These are sciences for which Mantegazza played a pioneering role in Italy which is still to be completely evaluated. In the Fisiologia del piacere, as well as in Quadri, the author shows an uncommon experience of the human states of mind and "inebriations". The author himself made a "wise and copious" (these are his own words) use of drugs, in particular cocaine to a ripe old age. He was for the replacement of tobacco with coca, as he thought the latter a healthier pleasure: "Become a coquero; the air which you make unhealthy for you and uncomfortable for other people will again be pure and if you choose good quality coca, you will see that a pinch of sleeves chewing softly, is as good as some cigars and will warm your heart inside and outside" (rep. in Every Body, 1876:210). In spite of the fact that I have personally ascertained that the name of Mantegazza is well-known to many people, the biographical studies on this authors seem to be still rare. The few biographical outlines that I am able to present here have been taken from books on the history of cocaine (Worthon, 1980; Arnao, 1980; Malizia & Ponti, 1992). 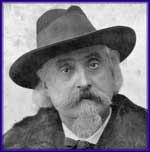 Paolo Mantegazza was born in Monza in 1831. He was a hygienist doctor, for a certain time he held the chair of General Pathology at the University of Pavia. In this town, he founded the first laboratory of General Pathology in Europe. Mantegazza also engaged himself in political activity. He was Deputy in the Parliament of the new-born Kingdom of Italy from 1865 to 1876, then he was nominated Senator. In 1870, in Florence he founded the first chair of Anthropology and his influential position as a senator helped him in founding the Florence Anthropological-Ethnographical Museum. In 1871, together with Felice Finzi, he founded the magazine Archivio per l'Antropologia e l'Etnologia, which is still published. He also was a great traveler. His travels to South America are memorable. In Brazil, Paraguay and Uruguay he is acknowledged at the present time as a "classic" author. His Cartas Medicas sobre la America Latina, of 1858, in which first-hand ethnological data are reported, have been reprinted several times in Latin America. In South America he got to know coca and guarana. We do not know which other psychoactive plants or beverages Mantegazza had the occasion to experiment during his South American travels. It is sure that he had a very curious disposition and that human "inebriations" were one of the main interests in his life. It is probable that a more careful reading of the wide literature left by this author, as well as the examination of the hundreds of his letters, at the present time kept at the Mantegazza's Archives in Florence (cf. Frati, 1991), may offer a more complete outline of the relation which Mantegazza had with the different drugs which he little by little met with and which he studied so carefully. Mantegazza was aware of the pioneer work which he was carrying out - « All this will be great science in the near future» (Quadri, I:180) - and that the important history of the relation of man with drugs was still to be written: « The history of nervine substances studied in its manifold relations of civilization, health and medicine is still mere wishful thinking» (Q., I:178). He knew by intuition the importance and the fundamental role of "nervine" nourishments - as he liked to name pychoactive drugs - for human life. He was persuaded that "an adult man, at the height of all nervous functions can use these nourishment with careful abundance" (Q., I:175). With the "ingenuously" racist outlook typical of the nineteeth century man of science, he added that « men need them more than women for their brain and muscles work more» and that « the civilized man needs and enjoy them more than the uncivilized person» (id.). Mantegazza was persuaded not only that a "wise" use of nervine substances was harmless, but also that this human behavior was necessary: « the heart (..) does not accept a diet excluding them» (Q., I:176); « nervine nourishment make life happier. Under their action the consciousness of existing always increases, troubles are mitigated or forgotten and cheerfulness which can reach the maximum degree of happiness, is aroused» (Q., I:177-8). After a brilliant exposition of the concept of "inebriation" - including the idea that « one can be inebriated by joy, love, ambition: and we have the inebriation of youth, of glory, and even of the religious feelings. Each passion may have a paroxysm resembling inebriation» (Q., I:185) - Mantegazza tried a classification of the types of "inebriation" and of the "nervine" nourishment. He distinguished soporific, convulsive inebriation and inebriation caused by movement, and acknowledges the complexity of the qualitative variations and of the intermediate forms of these states: « the degrees of inebriation are many and also in its most elementary forms soporific and convulsive, they join together with so many intermediate degrees that it is difficult to determine which are the essential features of all possible inebriations. However, all men and all languages agree on attributing to inebriation the characteristic of exaltation of emotional or intellectual powers leading us upwards and out of the ordinary state of our sensations and that almost always is accompanied by pleasure, at least at its first degrees» (Q., I:184-5). The "movement inebriation" is that caused by particular techniques of dancing and muscular frenzy, and it is surprising how Mantegazza was able, in those times, to recognize and make more valuable this technique of modification of consciousness, so powerfully come to the forefront nowadays: « Between the artificial inebriation produced by the absorption of nervine nourishment in the blood, and the spontaneous one rising from the fire of passions, we have a muscular inebriation, which is between one and the other and which almost reunite them by means of a very natural groundwork, being it dependent on our will, for it is produced by a certain abuse of voluntary muscles, and on the other hand deviating from higher degree inebriation» (Q., I:186). Mantegazza defines his Quadri as « a comment on a page of the natural history of pleasure» . Set at the first place in a recent Italian chronological bibliography concerning psychoactive compounds (SISSC, 1994), the first part of the work deals with feasts and the collective forms of human amusement. The second part of the first volume and the entire second volume are given up to different types of "nervine" nourishment. In 900 pages approximately, the author ranges from alcohol and fermented beverages to coffee, tea, mate and guarana, from tobacco to opium, from haschisch to coca and kawa. One chapter deals with fly agaric and agahuasca (ayahuasca). These are pages of significant historic importance which will be presented in full in the next issues of this magazine. As for ayahuasca, Mantegazza bases essentially on documentation proposed by Villavicencio in 1858, and erroneously identified the plant from which the beverage is obtained with a species of Datura. Apart from this and other inexactitudes, due to the scarce and confused documentation peculiar to those pioneer times, the exposition of the history of these drugs is learned and up-to-date. It is enough to examine the bibliographies placed at the end of each chapter - bibliographies which collect works of the eighteenth and nineteenth century and which for this reason are now very useful - to understand the author's preparation in dealing with the subject. Incidentally, it was precisely the examination of the valuable bibliography placed at the end of the Quadri's chapter given up to cannabis which in the past months made me "rediscover" the origins of the connection of modern Italy with this plant, typically Milanese origins dating back to the nineteenth century, which Mantegazza was aware of (and which are described in detail in my book L'erba di Carlo Erba- Carlo Erba's grass, being published). I believe that there is no better provisional conclusion than that of presenting the final words of Quadri, all projected towards a future which Mantegazza belonged to, in a never-ending state of "inebriation caused by far-sightedness and optimism": « The study of human phenomena, which I am dealing with in this book, makes me understand that men will always have feasts and inebriations. Nature, still little explored and even more chemistry will give our descendants a thousand new nervine nourishment which will stimulate their nerves and brain in many different ways; and hygiene will adapt them to the needs of the different races, ages and constitutions. Their alternate and wise use will be one of the most fertile pages of the art of life, and joy will go together with health and power. As man rises the more will he throw away of vice and prejudice, two almost inseparable brothers. As the horizon of science widens before his enthusiastic eyes, he always finds greater and more moral joys. Inebriation, which is not vice, which is not cynicism, which is not habit, is vivifying joy which gives strength to the springs of life. Aestethics of nervine nourishment will grow indefinitely and indefatigably, as long as our planet will have a man's foot on» (Q.,II:680). Arnao G., 1980, Cocaina, Feltrinelli, Milano. Every Body, 1876, Sulla coca, Ann.Chim.Appl.Med., 62 (3°s.) :207-211. Frati M.E., 1991, Le carte e la biblioteca di Paolo Mantegazza, Giunta Regionale Toscana, Firenze. Hofmann A., 1995, Comm.pers. 14 marzo. Malizia E. & H. Ponti, 1992, Coca e cocaina, Newton Compton, Roma. Mantegazza P., 1853, Sull'America meridionale. Lettere mediche, G. Chiusi, Milano. --, 1858, Sulle virtù igieniche e medicinali della coca e sugli alimenti nervosi in generale, Ann.Univ.Med., 167: 449-519. --, 1859, Sull'introduzione in Europa della coca, nuovo alimento nervoso, Ann.Chim.Appl.Med., 29 (3°s.) :18-21. --, 1859, Lettere mediche. Lettera Viii, sul mate, Gazz.Med. It.-Lomb., 4(4°s.) :85-92. --, 1865, Del guaranà, nuovo alimento nervoso, Ann.Chim.Appl.Med., 40(3°s.) : 8-13. 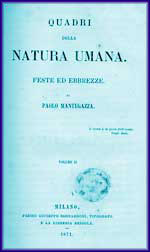 --, 1871, Quadri della natura umana. Feste ed ebbrezze, 2 voll., Brigola, Milano. --, 1877, Fisiologia del piacere, G. Bernanrdoni, Milano. --, 1880, Fisiologia del dolore, Paggio, Firenze. --, 1887, Le estasi umane, Mantegazza Ed., Milano. --, 1890, Le leggende dei fiori, Dumolard, Milano. Samorini G., 1995, L'erba di Carlo Erba. Per una storia della canapa indiana in Italia (1846-1948), Nautilus, Torino. Sissc, 1994, Bibliografia italiana su allucinogeni e cannabis, Grafton, Bologna. Worthon D.S., 1980, Coca e cocaina, Savelli, Roma.